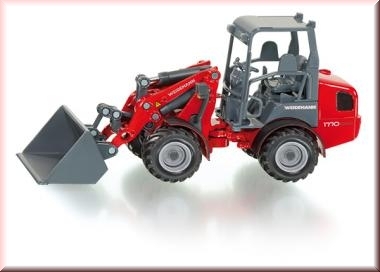 This small and nimble four-wheel loader from the Weidemann brand is an essential machine for every medium- and large-sized agricultural unit. The machine easily masters even the tightest curves thanks to the folding axle. Realistic work is easy using this model, as the loading arm and shovel are designed to move with swivel-joint operation. The open driver's seat is finished to high-quality design detail - as with everything on this 1:32 scale model. The mainly die-cast metal model drives on original detail wheel rims with on-road rubberized tyres. Attention! Not suitable for children under 36 months. Suffocation due to small parts. This Product was added to our catalogue on Monday 06 July, 2009.